Here are the most basic piano chords we use to play chord piano. In this lesson you will learn how a chord is built and some typical ways how chords are written. The first chord to learn when you start playing chords, is the root position three-note chord. It is also called a triad since it has only three notes; a root, a third and a fifth. Basic chords are built with thirds stacked on top of each other. Learning to play triads (which are the basic three note chords) is the first step to know when learning chord piano. It is also very easy! Root position means that the chord is in its basic position with all the notes a third apart (skipping one white key between them). The bottom, or lowest note then gives its name to the chord. 1= The root is number 1, the base-note of the chord. The root gives the name to the chord. 3= The third is two steps up (to the right. It very important, since it gives the sound of either major or minor to the chord. 5= And the fifth is… count from one, two, three, four, and five! The fifth gives a more complete sound to the chord. A triad can be either major or minor depending on if the third is a major or minor third. Your root can be any note (or key) at all. The third has to be either two whole steps up, a major third which gives the color of major to the chord. Or 1 and ½ steps up, this is minor. Magic! The fifth has to be 3 and 1/2 steps up from the root- because a basic major or minor chord must have the interval of a “perfect” fifth between the lowest and the highest note. 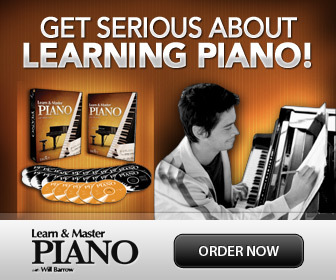 What Other Basic Piano Chords Are There? You can add any other notes, as spices, to change the sound of the basic piano chords. A seventh chord is a four-note chord. You add a 7th to a triad like this; just continue counting from the root (as number 1) and play 1-3-5 and 7! An added 7th gives the chord a strong pull- it wants to go somewhere! The strongest “pull” is in the small (regular) 7th chord (C7) also called "Dominant 7". While a Major 7th chord is more open and “jazzy” (Cmaj7). “Sus” stands for suspension. There are two types of Sus chords, Sus 4 or Sus 2 (also called Sus 9). Allthough the Sus chords have only 3 notes, they're not called triads. Like this: play 1, 4 and 5. Wow! Beautiful- especially if you go back again to 3. This is called a C sus-4. Or change 3 for a 2, and go back to 3. Sounds similar? We call this C sus-2. A diminished chord is another triad, and is made from only small (minor) thirds stacked on top of each other. Play the root position chord 1-3-5 with a minor third. Then lower the 5 ½ step down. Cool! This is a diminished chord! Continue stacking as many small thirds you like, it is still a diminished chord. Normally we use 3 or 4 notes for a diminished chord, unless you have really huge hands! An Augmented chord, also a triad, works the other way around. It is composed of only major thirds. Try it like this: Play a root position chord 1-3-5 with a major third. Now raise the 5th ½ step up. This is called an augmented chord. The most common are augmented 3 or 4 note chords; called Major (+5) and Major 7 (+5). When you play chord piano, you usually read chord symbols. You will see the name of the root (any of the note names) an m (if the third is minor) and a number for any notes that have been added to the basic three notes of the triad. So 1-3-5 is never written since it is the basic chord formula. 1. C is the root, (number 1). 2. “m” means that the 3rd is a minor 3rd. (The Major 3rd is never written). 3. 7 is the added note the seventh step up from 1. (In this case it is a small or minor 7. If it would be the "big" or major 7, this would be written “Maj”). You may see other numbers in basic piano chords like 2, 4, 6, 9, 11, and 13. All those are additions to the 1-3-5 formula. The 5 can actually be left out, it is not so important, but the 1 (root), 3 and any "spice notes" like for ex. the 7th should be played since they give character! Another way of writing basic piano chords is with roman numerals, like I IV V for example. This is a clever way of writing chord progressions since you can use them in any key.